Thank you to everyone who entered my Sew Mama Sew giveaway. 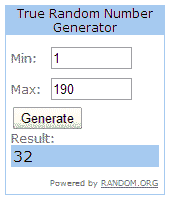 The lucky winner was number 32. That's Katie from Portland, Oregon. I've emailed Katie the good news, and sent the parcel off to her yesterday. Have fun turning the fabrics into something nice Katie.